The basic techniques of rug making were first developed in the East. Traditional Oriental rugs are made on vertical looms strung with 3 to 24 warp (vertical) threads per cm (8 to 60 per inch of width. Working from bottom to top, the rug maker either weaves the rug with a flat surface or knots it for a pile texture. Pile rugs use 5- to 7.5-cm (2- to 3-in) lengths of yarn tied in Turkish (Ghiordes) or Persian (Sehna) knots with rows of horizontal weft yarn laced over and under the vertical warp threads for strength. After the carpet is completely knotted, its pile is sheared, and the warp threads at each end are tied into a fringe. The finer the yarn and the closer the warp threads are strung together, the denser the weave and, usually, the finer the quality. Fine-textured and valuable rugs have 62 or more knots per sq cm (400 per sq in) ; coarse-textured rugs may have less than 8 per sq cm (50 per sq in). In traditional Scandinavian weaving (rya) the knot is actually tied like the Turkish knot, but the pile alone is 5 to .5 cm (2 to 3 in) long, and the rows of knots are separated by 10 to 20 weft rows. Flat-woven rugs are lighter in weight and less bulky than pile rugs. The best-known and earliest type is the kilim, which has plain weave made by shooting the weft yarn over and under the warp threads in one row, then alternating the weft in the next row. The soumak type is woven in a herringbone pattern by wrapping a continuous weft around pairs of warp threads. The same materials are used in flat-woven and pile rugs. Warp and weft yarns are either wool or cotton. In pile rugs, the knots are usually wool, sometimes goat's or camel's hair, depending on the region. Silk, traditionally a costly material, is found principally in fine Persian carpets and some Chinese rugs. Yarns have been used in their natural colors or colored with dyes extracted from flowers, roots, and insects. Colors, available in a wide spectrum, often have had symbolic as well as decorative importance, especially in Oriental rugs. Despite the existence of distinctive regional styles and motifs, many designs are common to diverse regions in the East and even in the West. These designs may be rectilinear or curvilinear, naturalistic or abstract; they may be based on motifs such as the sun wheel, the tree of life, the cloud band of China, the pear-shaped figure (boteh) that heralds the Islamic paisley design, flowers of all kinds, animals, birds, and insects. Muslim prayer rugs are always distinguished by the prayer niche (mihrab) woven into the pattern; this represents the actual prayer niche in the Great Mosque at Mecca, toward which the rug must point during use. In the West, rugs have been made by several other techniques as well. For hooked rugs, thin strips of outworn woolen goods traditionally were drawn through a linen, cotton, or burlap backing with a metal hook to form slightly raised loops on the surface. Later on, yarn was also used for hooking. Favorite designs of early-American hooked rugs included flowers, geometrical and abstract patterns, and pictorial scenes with landscapes and animals. For traditional braided rugs, strips of outworn cloth were plaited together and then wound flat in a circle or oval. In patchwork rugs, snippets of cloth were sewed on homespun woolen material. In Shaker rugs, cloth scraps were threaded together like a necklace and then sewed onto a strong backing material. In needlepoint rugs, each intersection of a mesh canvas backing is covered with individual stitches of wool yarn. Rugs are mentioned in the Old Testament and in Homer; they were known to the ancient Chinese, the Egyptians, and the Greeks. The earliest-known hand-knotted carpet, dating from about 500 BC, was discovered well preserved in ice in a tomb at PAZYRYK, in southern Siberia. Rugs were made in Persia during the reign of Cyrus (549-530 BC), whose tomb was said to have been covered with precious carpets. By the l6th century, traditions of rug making were highly developed in Persia and Turkey. Rug making then spread north to the Caucasus and east to India, Turkistan (Turkestan), and China; finally, it reached Europe and the West. The American Indians developed weaving traditions independently. A graceful, curvilinear style and a masterful use of color is typical of Persian rugs. The great tradition of rug making culminated in the 16th and 17th centuries in densely woven court carpets of the Safavid period. Usually classified according to the particular type of design displayed in each, they include medallion carpets, whose large central medallion patterns are embellished with flowers; garden carpets, incorporating flowerbeds, paths, and often even canals and pools; flower carpets; vase carpets, in which an ornamental vase holds flowers and vines; animal carpets; and hunting carpets, portraying a favorite royal sport. Regional and village carpets of Persia most often use the central medallion design or all-over pattern of flowers or other flowing forms; they are usually but not always more coarsely woven than court carpets. Regional carpets are usually designated by their place of origin, such as Bakhtiari, Sijar, Feraghan, Hamadan, Herez, Isfahan, Kashan, Kerman, Khorassan, Kurdistan, Sarouk, Sehna, Shiraz, and Tabriz. Simplicity of design, serenity of composition, a limited range of subdued and harmonious colors, and symbolic motifs characterize Chinese carpets, The earliest surviving examples are from the late Ming dynasty in the mid-17th century; they are decorated with simple arrangements of geometric forms, typically a medallion, sometimes with a dragon, and repeat patterns. Rugs of the Kangxi (K'ang-hsi) period (1662-1722) continued Ming forms with greater naturalism and more ornamentation. From the late 17th century onward, the Chinese have woven the unique pillar rugs designed to encircle the columns of palaces and temples during festivals. During the latter half of the 18th century ornate and opulent palace rugs, the design of which was greatly influenced by the floral patterns of Persia, were woven. Rugs for export followed, favoring a central dragon motif or ornate floral designs. At the end of the 19th century, anilines replaced natural dyes and introduced an often harsh and garish quality to the once-harmonious color schemes. Frequently recurring designs in Chinese rugs include geometrics such as the familiar meander or key border and fret; animals, including various dragon forms, the Fu dog, storks, cranes, butterflies, and bats; realistic and identifiable flowers, each with its symbolic meaning; Taoist and Buddhist symbols; natural forms including clouds, water, and mountains; the Chinese character shou, the symbol for long life; and the many permutations of round medallions. The golden age of Indian rug making occurred under the Mogul emperors who ruled from the mid-16th to the mid-17th century and who imported not only designs and traditions from Persia but weavers as well. The greatest Indian examples were the finely woven florals and the hunting carpets, with their remarkably naturalistic designs. Caucasian rugs are made by various tribes in the mountainous district between the Black and Caspian seas. The designs are often dense all-over patterns of geometric elements � squares, diamonds, stars, and frets � or motifs drawn with angular lines in bold, clear colors. The rugs are generally small, with wide multiple borders. The best known include the Baku, Chichi, Daghestan, Kabistan, Kazak, Kuba, Shirvan, the flat-woven Soumak, and the Karabagh, with an unusual floral design of Persian influence. The Armenian dragon carpet, combining an ancient dragon motif with Persian flowers, was made during the 15th and 16th centuries and was much more opulent than the better-known yet simpler Caucasian rugs. Turkish carpets were the first Orientals to be imported into Europe and often appeared in late-Renaissance paintings; Hans Holbein the Younger painted a particular type so often that it came to be called a Holbein. Most were woven in villages in Anatolia (the part of Turkey that lies in Asia Minor) in bright, rich colors with geometric forms such as the star and diamond as well as linear floral forms. In the mid-16th century, elegant court rugs woven on royal looms in Constantinople incorporated the more graceful curvilinear style of Persia. One well-known type was the Star Ushak, with its distinctive star-shaped medallions. Turkish prayer rugs are of particular interest. The mihrabs usually have pointed arches and stepped sides, and the field is sometimes ornamented with a hanging lamp or candlesticks. The best known are the Ghiordes, with freestanding columns supporting the mihrab; Ladik, with its stylized tulips; Kula; Konya and Mudjur. Regional carpets with primarily geometric designs include the Bergama and Yuruk. Carpets made by the nomads of central Asia are collectively designated as Turkoman carpets. These carry a number of names including Afghan, Baluchi, and Bokhara, the last comprising Royal (Tekke), Pendeh, Yomud, and Beshir carpets. The geographic and cultural isolation of the region accounts for the distinctive character of the rugs. Most are reddish and have a geometric design that incorporates, in an all-over pattern, the coat of arms (gul) of the individual tribe. Samarkand, although actually a collection and marketing center rather than a rug-producing center, is the name applied to the rugs produced more than 300 km (about 200 mi) away in Kashi (Kashgar) , Hotan (Khotan) , and Yarkant (Yarkand) in what is now far western China. The Samarkand style is less angular than the Turkoman style and not as graceful as that of Chinese rugs. The principal design motifs are medallions in the shape of flattened circles, a pomegranate tree growing out of a vase, and such Chinese figures as bats, butterflies, and frets. Rug making was introduced (AD 711) to Spain by the invading Moors. Their rugs first incorporated the geometric forms of Islamic art; later, combined Muslim and Christian motifs were used, particularly heraldic motifs, as in the well-known Admiral carpets woven for the heirs of Spanish admirals. After the 18th century the best Spanish rugs were the low-looped, folk-art Alpujarras made by the peasants in the mountain district of southern Spain. The best-known French rugs are the AUBUSSON, a flat tapestry weave, and the Savonnerie, a knotted pile or tufted weave. Aubusson rugs had been woven for 9 centuries when, in the early 17th century. Henry IV established court looms in the Louvre to produce Oriental-type pile carpets. These rugs came to be called Savonnerie for the soap factory (savonnerie) that housed the looms for a time. The designs of both types reflected contemporaneous French art styles. The English rug industry, developed in the 16th century, was invigorated by the French Protestants, many of them weavers, who fled to England for religious asylum after the Edict of Nantes was revoked. Early carpet works at Wilton and Axminster wove pile carpets in which bright floral patterns predominated. The great industrial advances of the 18th century � the spinning jenny, power looms, Jacquard weaving � revolutionized carpet making and affected design as well as production. Reacting against the machine technology and Victorian taste, the 19th-century ARTS AND CRAFTS MOVEMENT, led by William Morris, emphasized handcrafts and original design in the decorative arts. Scandinavia's unique shaggy pile weavings, called rya, were first woven as a defense against the harsh northern climate. Early designs were simple geometrics; later ones included ecclesiastical and folk motifs such as stars, wheels, flowers, and trees. Although folk rya declined in the 19th century, it is currently flourishing as an art form, especially in Finland. Typical Navajo weavings repeat a few simple geometric shapes � stripes, rectangles, zigzag lines, diamonds � in minimal designs using primarily natural-colored wools (usually black, gray, tan, or brown) in a flat tapestry weave. The westward expansion of the railroad in the 1880s introduced commercial yarn and aniline dyes (replacing vegetable dyes). Among notable contemporary Navajo designs are those produced at Chinle, Arizona, and at Two Gray Hills and Ganado, New Mexico. More than 97 percent of all machine-made carpets are now made of synthetic fibers, principally nylon. Area rugs are also fashionable; these, in both contemporary and period designs, are often made of natural fibers like sisal or of hand-tufted wool in natural colors. Various textures are used, among them surfaces that are sculptured or cut to different levels and areas of both cut and uncut loops. Many contemporary artists design pile or flat-weave rugs and wall hangings. Durable synthetic fibers are also used outdoors on patios, on boats, and around pools. India is a leader in the mystical art form of hand knotted oriental carpets. It was Akbar the great, Mughal leader of India in the 16th century, who setup workshops to exclusively weave carpets for the royal palaces. To make the finest carpets, he imported leading artisans from the Persian Court of the Safavid dynasty. After the decline of the Mughal empire in the late 1700's, the British reestablished fine carpet making in the 1800's. 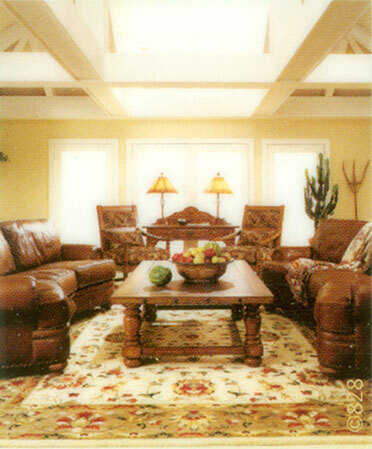 Primary rug making centers are in Agra, Mirzapur, Jaipur, Amritsar, and Bhadohi. Handmade carpets represent months and even years of time-honored processes including: sheep raising, shearing, carting, spinning and dying wool, designing, weaving, finishing, and finally washing the rug. All are considered individual art forms that create a spectacular floor to beautify your home and office. Carpet making in China dates back to the Central Asian regions of Xinjiang (Chinese Turkistan) and Ninghxia (Central China) during the Sung Dynasty (960 to 1279 AD). To create rugs for nobles and upper classes, Chinese emperors in the mid 1800's first assembled rug factory workshops in Beijing and Tianjin (Northeast China). Following detente between China and USA after Nixon's visit in 1971, rug production blossomed for export from China. Today China is one of the largest producers in the world and collaborates closely with American importers and designers to meet local color and quality needs. The traditional Chinese rugs feature large central medallions incorporating motifs and symbols, such as animals, flowers, and vases, framed by wide borders. China is now exporting Sino-Persian rugs that emulate the finest rugs made in Persia. Silk, wool, and silk & wool rugs are made of the highest quality found anywhere in the world.